Heat oven to 400°F. Lightly grease 13x9-inch pan. Toss mushroom caps with olive oil; place stem-side down in pan. Bake 12 minutes; remove, and drain any liquid from pan. 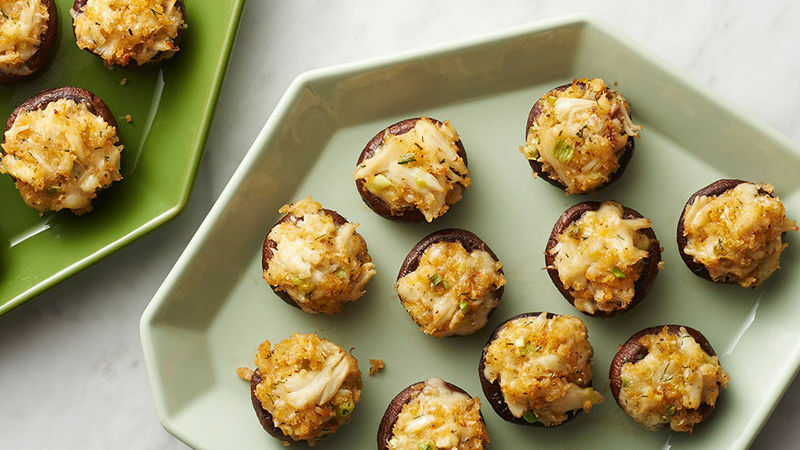 Turn mushrooms over for stuffing. Meanwhile, in medium bowl, mix bread crumbs and melted butter. Add fontina cheese, crabmeat, green onions, Parmesan cheese, seasoning, lemon peel, dill weed and salt; stir well to blend. Divide, and scoop mixture into mushroom caps. Bake 10 to 12 minutes or until cheese is melted and filling is lightly browned. White mushrooms can be substituted for cremini mushrooms in this recipe. Want to add a little heat? Add 1/4 teaspoon ground red pepper (cayenne) to the crab filling.